With The Duke and Duchess of Cambridge (plus Prince George and Princess Charlotte) arriving in my hometown of Vancouver in a few days, I thought I would showcase some Canadian fashion brands for the ‘middle class’ (i.e. not the sort of brands with a security guard or stuffy salesperson turning you away with one look). A few of these might have been introduced on some blogs dedicated to The Duchess of Cambridge’s fashion, but all of the below brands are worth mentioning and many are still Canada-only (but with enough interest, might open stores internationally?). Wherever you come from – be it Canada or another country – I hope you’ll enjoy discovering some Canadian brands and if you have more suggestions (perhaps you’re a designer and you’d like a shout-out), do leave a comment below this post! This bilingual online clothing store from Montreal is a dream store for old-fashioned ladies! I love the use of Victorian frames and engravings in the website design. There are so many dresses to choose from and I find myself coveting the entire collection sometimes that I have to step away. Le Chateau of Montreal was my favourite university-days brand for party or semi-formal attire. (You honestly can’t go wrong with brands from Montreal.) There’s a page just for clothes that are made in Canada (featuring this tweed dress and ponte dress) in case you’re feeling extra patriotic. This had been my go-to brand for Canadian-designed and made-in-Canada clothing for work and casual wear. Unfortunately, the boutique closed all its stores in Canada in 2014 but still sells clothes online (albeit the styles are not quite the same). It’s really such a shame because the design and quality were excellent. Here’s a brand born in Vancouver! The two Armstrong sisters came up with PARTYSKIRTS dedicated to pretty skirts with pockets (this should be a must in all skirts and dresses, wouldn’t you agree?) in classic and lady lengths (above the knee and knee-length). Plum hails from Kitsilano, Vancouver. The brand is proudly Canadian, with over 50% of clothing designed and made right in the city. You’ll find clothes for work and casual (but not formal or semi-formal wear). Also hailing from Montreal, Reitmans has been in the family since 1926. Although I have never bought clothes from Reitmans, I used to get some of my university/work clothes from Reitmans’ daughter company, SmartSet, which I’ve just learned has had to close its doors across Cnada and no longer sells clothes online. Another daughter company of theirs [that I trust is doing well] is RW & Co, which I’ve also liked for office chic clothing. I had no idea about this but the proudly Canadian brand was founded by two Americans who fell in love with Algonquin Park in Ontario after both attending camp there. The clothes you’ll find here are mostly sporty and usually have the famous beaver logo so Canadians can represent their national bucktooth friend abroad. I’m not a jeans girl but this brand made me want to buy jeans (still haven’t because I missed my chance in Canada) because they’re stretchy, flexible, and comfortable yoga jeans (no, they’re not jeggings). All jeans are made in Quebec. Another Montreal-founded international brand, Aldo shoes always has affordable dress and casual shoes. I found this brand whilst googling for packable boots (I knew about packable ballet flats but could boots be packable?). These boots come with a waterproof storage bag and according to this reviewer, they’re comfortable, easy to pack, waterproof, and practical. Established in 1910, Blondo began coming out with waterproof leather boots in the 1980’s. The ever stylish brand always has the most elegant and functional (i.e. soles with grip) riding boots available. Some of my favourites are Vida, Vassa, Isa, and Iona. John Fluevog started designing and selling unconventional shoes in the 1970’s in Gastown, Vancouver, BC. I believe I first noticed Fluevog’s shoes when I spotted a pair of very Victorian-looking boots (possibly this pair) in the window display. 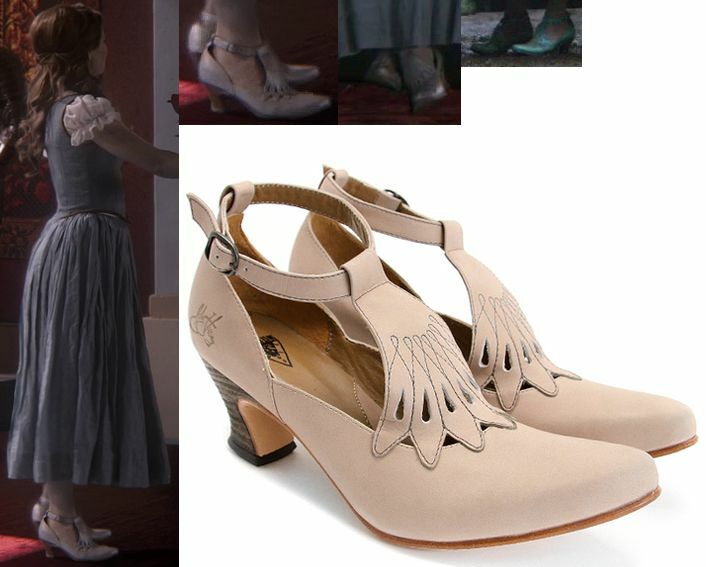 Every so often, I would spot more fairytale- or historically-inspired shoes, such as Revelation, Elisabetta, Miracles Medugorje, and this pair worn by Belle in Once Upon a Time. (However, I still don’t own a pair.) Another awesome thing about Fluevog? He lets you contribute ideas and, if he likes your design, your design will come to life and you can own your dream pair! This winter- and rain boots brand for adults and tots has been family-owned in Quebec since 1898! (Kamik, by the way, are traditional Inuit boots.) Since UK’s Hunters were out of my price range, I had settled for Kamik’s tall Jennifer wellies. These wellies are 100% rubber and made in Canada. What I love about Kamik is that they’re very eco-conscious – did you know that Kamik will recycle your old Kamik books to turn them into new products? I met The Saucy Milliner when she was based in Vancouver. You may recognise some of her hats in the ABC fairytale series, Once Upon a Time. The Saucy Milliner is now based in the Distillery District in Toronto. I recommended her on my blog 4 years ago, and also shared posts on hats I learned to make with her using her signature hat blocks: Ingrid, asymmetrical cloche hat 1, asymmetrical cloche hat 2, straw boater hat, Juliet cap, and wide-brimmed hat. She also made a cute mini boater for me. If you’re looking for something Canadian, you’ll love her Maple Percher and First Autumn Back! This entry was posted in Fashion, Vancouver and tagged Canada, dress, shoes.